The Port of Duluth-Superior is the most centrally located, multimodal transportation hub in all of North America. It anchors the western terminus of the Great Lakes St. Lawrence Seaway system, connecting the heartland of the continent to customers and shippers around the world. 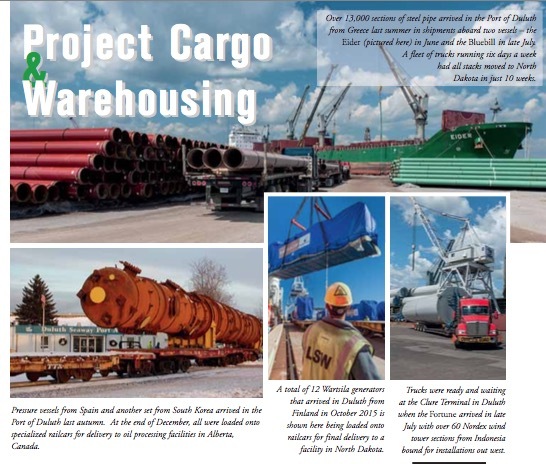 Last year (2015) was a banner year for moving project cargo through the Port of Duluth. The Duluth Seaway Port Authority’s Clure Public Marine Terminal saw a 40% spike in volume of freight tonnes moved across all transport modes (water, road and rail). Utilizing every square inch of enclosed warehouse space (360,000ft2) and every ounce of existing outdoor storage capacity, Lake Superior Warehousing, the Authority’s operating agent, handled some 25,000 truckloads and well over 4,000 rail cars of commodities in addition to maritime traffic. More than half of all wind turbine shipments on the Great Lakes-Seaway system move through the Port of Duluth. This reflects not only exceptional service but also Duluth’s strategic location as the closest inland port to wind energy developments across the Upper Midwest and south central Canada. With the US government’s five-year extension on Production Tax Credits (PTCs) for wind energy projects, Duluth expects to handle additional shipments of turbine components in 2016 and looks forward to an increase in those specific project cargoes again in 2017. The Port Authority also is making great progress on its new Port of Duluth Intermodal Project — a nearly $18 million redevelopment project on a 28-acre pier adjacent to the Clure Terminal, scheduled for completion later this year. Known primarily for handling non-hazardous dry bulk commodities, the combined Port of Duluth-Superior moves some 38 million short tons of cargo each year — iron ore, coal, limestone, salt, cement and grain — via 20 privately owned and operated docks. The Port Authority’s Clure Public Marine Terminal, the Port’s only general cargo facility, is operated by Lake Superior Warehousing. Its crews have earned a world-class reputation for safe and seamless transport of a diverse mix of heavy lift and over-dimensional project cargoes — turbines, pressure vessels, generators and other modules to serve the mining, manufacturing, wind energy, oil/gas exploration and power generation sectors of the global economy. Mediterranean, North Africa and the Middle East (15 to 18-day transit times). On a regular basis, Duluth also handles heavy lift/project cargoes from as far away as South Korea, India, Indonesia and Japan plus outbound shipments to Central and South America with up to three shipments a year of inbound Brazilian clay for the region’s papermaking industry. When it comes to moving project cargo, Duluth has all the right connections. Customers can avoid congestion and costly delivery delays commonly experienced at coastal ports. Here, with direct access to four Class I railways (CN, CP, BNSF and the UP) and to major north/south and east/west freight corridors, the Port of Duluth is one of the least congested project cargo ports in the nation — offering the best road and rail clearances to and from the interior of North America. In addition to overseeing maritime operations at the Clure Public Marine Terminal, LSW handles the facility’s warehousing, storage and transload business, as well. This truly has become a regional logistics hub — a storage and distribution centre not only for the forest products industry but also for manufacturers and agricultural groups looking to streamline supply chains as they move commodities inland or overseas. The Port of Rotterdam is one of the giants of the dry bulk scene generating an annual throughput of nearly 90 million tonnes. The Port of Rotterdam isn’t just Europe’s largest dry bulk port; it is the largest industrial cluster and logistics hub in Europe. On the mouth of the river Rhine you will find a complete cluster of terminals, storage companies, maritime services providers and logistics companies for all cargo types. Shipping line operators in the dry bulk sector could benefit from this crossroad of cargo types and its experienced service providers. In today’s market, finding efficient logistics solutions is key. For shipping operators in the dry bulk sector, finding a one-stop- shop solution can be one of them. “The port of Rotterdam is also a port with extensive breakbulk and project cargo facilities and therefore offers the option of combining the transshipment of dry bulk cargo with breakbulk or project cargo in one call,” says Robert Jan Timmers Business Developer Breakbulk at Port of Rotterdam Authority. “In the last few years we have seen a healthy growth of the breakbulk figures,” says Timmers. “And investments have been made and are being made by both private companies and the port authority, further enhancing the potential of the breakbulk and project cargo cluster.” Investments in current facilities include the refurbishing and upgrade of the Broekman Project Services covered warehouse facilities (with a 700-tonne-capacity overhead crane), the construction of a RoRo-ramp at Broekman Distriport and a new 280-metre quay side at Rhenus Logistics Deepsea Terminal. “Investments are also being made in new facilities such as the SIF Group/Verbrugge International combination for a dedicated terminal for offshore projects (e.g. offshore windfarms). Looking forward we are investigating the possibility of further facilitating the breakbulk and offshore sector by creating additional space for a greenfield terminal location in the Maasvlakte Area. This should present ample opportunities for handling offshore-related cargoes and serving as marshalling yard for large-scale onshore and offshore projects.” In Rotterdam three independent private companies operate a large number of floating cranes, capable of handling all kinds of cargo, up to 2,200 tonnes. The floating cranes of Bonn & Mees, Boskalis and HEBO Maritiemservice perform excellent services not only to breakbulk stevedoring companies, but to the shipbuilding and manufacturing industry in the Rotterdam area as well. Next to this, their cranes are on call serving the shipment of project cargoes by scheduled container liner services. Combining the wide range of dry bulk facilities with Rotterdam’s breakbulk or project cargo facilities could mean delivering both dry bulk goods and breakbulk cargoes in just the one port. It is even possible to load or unload both cargo types at the same location, at the same time, thereby saving precious time. Shipping operators like Nirint Shipping, NYK Bulk & Projects, MACS and Gearbulk already integrated this solution in their liner schedules. This can either be done ship-to-ship on one of the many ship-to-ship transfer facilities in the port of Rotterdam, or ship-to-shore, all in one stop and carried out by experienced stevedoring companies and private suppliers. The abundance of onward connections to the hinterland and the short sailing times into the port of Rotterdam make the port an obvious choice. Maritima Dominicana, S.A.S. is a ship agency and stevedoring company with 45 years of experience offering a full range of services to the maritime industry, both to ship owners and cargo interests. The agency handles port agency and ship husbandry matters for all kinds of vessels, regular liner, tramp calls as well as cruise ships with passengers visiting the country. The agency also offers all kinds of efficient cargo handling, loading and discharging, achieving rapid turnaround of the ships under its care in all Dominican ports. Furthermore,Maritima Dominicana also offers all kinds of cargo storage and handling facilities at locations at or near the main ports. company created to handle all these requirements and follow up on all the special instructions with a team specialized in heavy lift cargo. Among the services provided are custom clearance, inland transportation, loading and discharging of cargo in ports and at job sites as well as ocean and air transportation. These oversize cargoes require specialized transport as well as detailed planning. Typical items handled are generators, turbines, boilers, towers, and windmills for power generation. The absence of standardization is what makes for individual transport planning. Special trucks or flatbeds are used. The company owns and operates a large fleet of vehicles and lifting equipment guaranteeing the proper handling of the cargo. Among these Maritima Dominicana have two lowboys with capacity of 35 tonnes, one with 50 tonne capacity (three axles) and one with 70 metric tonne (four axles), one multipurpose modular hydraulic trailer (six axles), two prime movers, one extendable lowboy (72 tonnes capacity), one extendable lowboy (50 tonnes capacity) and 10 flatbeds. Rigging is one of Maritima Dominicana’s specialties, using Jack and Slide System to avoid the use of cranes while placing cargo onto foundation. Having this chain of logistics in house the agency can assure its customers its absolute attention to the successful and timely delivery of their cargo. Maritima Dominicana also provides warehouse services for both long and short-term storage. A consolidation and de-consolidation warehouse which offers container lines, and importers in general a number of services and all types of cargo storage and warehousing. For the clients’ convenience there is a Customs House branch office within the premises, in order to expedite dispatch of the cargo. The warehouse has a storage capacity of 4,800m2 and also has heavy equipment for handling the different commodities that are stored whether they are palletized or not. Maritima Dominicana bonded warehouse was established to provide a quality service for integrated logistic processes and proper management of the supply chain, for companies operating at a local market, as well as those at the international one. The services offered are: Storage in dry and refrigerated areas as general, bonded, re-exporting deposit, Cargo Management, Stock List Management, Insurance Services, Customs Brokerage, Distribution, and Specialized Logistics for Free Zones. Warehousing and distribution are key factors in container logistics, hence we also offer off-dock storage for all sorts of imported containerized or breakbulk and project cargo. Container vessels load/unload in Caucedo, Rio Haina, Puerto Plata and Manzanillo. Caucedo is a dedicated container port and in Manzanillo there is constant traffic of reefer containers as fruit is exported. Containers can be moved off-dock, close to their final destination to save cost, enhance/complement the supply chain and facilitate the transport and distribution of containers. The company operates off-dock container terminals to handle empty containers and export cargo located strategically in the close vicinity of the ports of Caucedo, Rio Haina and Manzanillo. Maritima Dominicana’s Off-Dock Terminals were established in Haina, Caucedo and Manzanillo to create the first chassis pool and chassis and container repair facility in the Dominican Republic. The staff attends to all aspects of a chassis and container repair facility. Approximately 2,000 chassis are in the pool. In its warehouse Maritima Dominicana has a complete inventory of all parts required for container and chassis repair as well as the necessary tools and equipment. For major repairs Maritima Dominicana suggests mobilizing the container to its terminal, though minor repairs as well as washing and sweeping (food grade) may be done at the ports. AS DBT is focused on the handling of bulk and bagged fertilizers. The company was founded on 10 June 1997, the first terminal line started operating in December 1998. To date, the terminal has handled over 26mt (million tonnes) of cargo. The terminal enjoys all the benefits of the Customs Free Zone status. The Muuga Harbour is the deepest one among the Baltic ports and it is open for navigation in winter too. This allows DBT to function and carry out loading operations all year round. All fertilizers arriving by rail are emptied from the hopper cars at two purpose-designed discharge stations with four railway tracks. By means of conveyor system, the cargo is then delivered to the warehouses or directly to a vessel ensuring ‘direct transshipment’. The use of a special fertilizer shiploader guarantees highly efficient services for bulk cargo loading. Fertilizer blending and bagging (into 500–1,250kg big-bags) services are offered on-site by AS DBT as well as filling of bulk or packaged cargo into containers. AS DBT has a lot of experience in bulk handling of IMO Class 5.1 (ammonium nitrate) hazardous material as well as freights with high fluidity properties such as SOP. Competence and efficiency, flexibility and reliability, security and high standard performance are the principles of AS DBT activities laid down since its foundation. The quality and safety of the services provided by the company fully conform to all EU standards and requirements. The company has implemented the integrated management system confirmed by ISO 9001:2008 certificate. For covered storage of bulk cargo AS DBT terminal offers: one warehouse of arched type of up to 70,000 tonnes capacity; and eight dome-type warehouses of capacity from 8,500 up to 26,000 tonnes. The existing storage facilities with total capacity up to 192,000 tonnes allow the terminal to provide extra opportunities for efficient product segregation, ensuring no product cross-contamination, thus securing high safety of their qualities and properties. In 2015, in order to improve the final quality of the product and a more homogeneous composition of the blended cargo without lumps (which are larger than 10mm × 10mm), a vibrating sieve system was set on the feed hopper in the blending plant and in the device for packaging of goods. The possibility of accumulation of large consignments, as well as 288 metres long and 14.5 metres deep berthing line, gives the terminal an opportunity to handle bulk carriers of Panamax-size for shipping up to 70,000 tonnes of cargo. The company has operational bases in Louisiana at Myrtle Grove, Chalmette,Violet, Reserve, Convent and Port Allen. Between mile marker 56 and 158, the company operates 25 deep draught berths which includes eleven land- based docks and 14 midstream berths. The company can handle Capesize vessels in Myrtle Grove, Chalmette and Convent, Louisiana. The company has extensive experience in handling project, steel, general and breakbulk cargo and is continually investing in resources to optimize its capabilities to service existing and potential customer needs. From an equipment standpoint, the company’s fleet of Gottwald cranes is increasingly being utilized for the handling of general, steel, breakbulk and project cargo. In addition to the floating Gottwalds, the company has three land-based Manitowoc 300 tonne crawler and gantry mounted cranes. In 2015,Associated continued its commitment to offering customers the most efficient means to handle their products by upgrading its equipment. These additions include reach stackers, spreaders, specialized equipment attachments and the expansion of the forklift fleet. Multiple strategic locations to handle general, breakbulk and project cargo provide Associated and its customers competitive advantages. Located just below New Orleans between mile posts 83.5 and 90.5 AHP, the St. Bernard Port, Harbor & Terminal District is a full-service marine terminal. Associated serves as the exclusive operator of the port’s marine facilities. At mile marker 83 in Violet, the company operates four docks that can handle up to Panamax vessels. Between mile markers 86.5 and 89.5,Associated offers three midstream buoys for the movement of bulk and general cargoes. These buoys have a distinct advantage due to the utilization of dual-sided discharge. The terminal has access to all six Class 1 railroads. Further upriver in the St. Bernard Port’s jurisdiction, the company operates the Chalmette Slip. The slip is the only slackwater harbour on the Lower Mississippi River. The facility consists of three deepwater docks with an adjacent 250,000ft2 of warehouse space available presently for general cargo and ten acres for outside storage and laydown area. The site also features truck and rail capabilities. A set of mooring dolphins are contiguous to the dock at the slip and retain a year-round depth in excess of 50 feet. midstream berths in the port’s jurisdiction. Globalplex is an ideal location for manufacturing, distribution and logistics companies. Warehousing, outside storage and logistics options are ample at the site. In order to service the needs of project cargo shippers, the terminal offers 340,000ft2 of warehouse space, 800,000ft2 of open storage pad space, bulk domes and green space with additional property for expansion located adjacent to the terminal. Logistical opportunities are offered by an intermodal transportation network featuring access to interstate highways and multiple Class I railroads. Associated owns and operates an intermodal terminal in the Greater Baton Rouge area. With more than 45,000ft2 of warehouse space and 130,000ft2 of outside storage, tailored solutions can be provided to satisfy customers’ storage needs. While the company is dedicated to providing top-quality equipment, facilities and resources for the handling of cargo, Associated’s skilled and productive workforce is the key factor to the success of the company. In the project and general cargo division alone, the senior management brings with it over 100 years of combined experience. Experienced in handling all types of general, project, breakbulk and steel cargo, the team’s understanding of complex projects allows it to handle modularized project cargo safely and efficiently for its customers.